In this, our first editorial as Editors-in-Chief of the International Journal of Art Therapy: Inscape (IJAT), we reflect on the history of the journal and announce exciting new developments as we move IJAT towards becoming an ethical research journal. Front cover of one of the first ever issues of Inscape, Volume 2, 1970. Around 1969 BAAT was beginning to take shape as a professional body albeit with very few members. John Henzell was Chair, Rupert Cracknell was Honorary Secretary, and both were art therapists in North London psychiatric hospitals. I had been drafted in to take minutes of the Council meetings due to my ‘organisational skills’ as well as my art degree (!). After a lengthy discussion about the idea of having a professional journal, the name Inscapewas born. This seemed to reflect the notion of ‘looking inward’. John Bennett, another art therapist, also joined the little team and work began. Bearing in mind we had hardly any money, it was an ambitious aim. Production was as follows: John and Rupert asked their clients to make images for the cover or did them themselves. Short articles were solicited from Council members or other art therapists or patients. I typed these onto special plastic sheets on an electric typewriter, courtesy of my workplace, around 100 copies of each sheet. The sheets were collected by my late partner, Dan Lumley and taken to John Henzell’s house in Islington. Large brown envelopes, labels, pens and plastic binders were gathered. A working party to collate, bind and distribute to all members was assembled. John prepared tables and a system for collating which involved going round and round the tables until the whole journal was ready to pass on to the binders. An important element in the collating process was red wine, copious amounts! When binders were safely in place, the journal was put into the brown envelopes, addresses added, and postage calculated. Members were pleased but sometimes astonished at the content of the journal. Accusations flew that the same people were writing all the articles. However, it was pointed out that it was because few people wanted to write for Inscape in the beginning! Other complaints were that pages were sometimes upside down or out of order or that the pages fell out of the binders … unfortunately the result of a little too much red wine or merriment round the collating table! I so enjoyed the early days of Inscape. Truly a collaborative event and one in which service users were certainly involved! Eventually the Council felt that a slicker production was needed (without the plastic binders) and Chris Woodtook over as editor. Over the next 36 years, the journal served as a key forum for the theoretical development of art therapy in the UK. In 2005, the journal’s title changed to ‘International Journal of Art Therapy: Inscape’ when it moved to publication by Taylor & Francis. The support and resources of this international publishing house have helped the journal to flourish ever since. … This was an historic step forward as it put the journal’s development of the art therapy evidence base on a firm academic footing. This development was followed by acceptance by a range of databases; Scopus, PsycINFO, Educational Research Abstracts online (ERA), Art Bibliographies Modern, Studies on Women and Gender Abstracts. The move to double-blind peer review also helped IJAT to develop its international profile, both in readership and contributions. This enhanced profile has since enabled IJAT to increase its publication rate from two issues to four issues per year. We are now taking on the reigns handed over to us by the past Editors following all their commitment, hard work and foresight, and we plan to develop IJAT as an ethical research journal. Our first step, agreed by the Editorial Board and supported by Taylor & Francis, has been to implement a basic data sharing policy. This means that IJAT now encourages authors to share and make data open where this does not violate confidentiality, protection of human subjects or other valid subject privacy concerns. 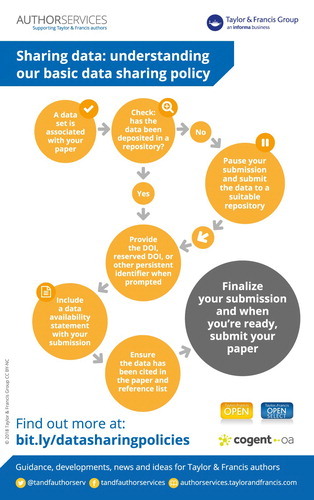 IJATauthors are also now encouraged to cite data and provide a data availability statement along with their papers. Sharing data publicly improves the robustness of the research process, supporting accountability, transparency, reproducibility and replicability of results. This can, in turn, advance discovery and knowledge. Sharing data also means that it becomes accessible to other art therapists, researchers, organisations, and across other professions and countries. Thus encouraging more collaboration between researchers and leading to the development of significant new findings. The public availability of art therapy research data can also increase the impact and visibility of the research, provide effective resources for education and training, and support the translation of research into practice. Sincere thanks go to all the past Editors, Associate Editors, peer reviewers and contributors for their hard work and commitment to the International Journal of Art Therapy: Inscape over the past 49 years. We look forward to working alongside and developing the IJAT networks over the coming years. International Journal of Art Therapy: Inscape, Volume 23, Issues 1–2, 2018. The first front cover under the new editorship of Dr Susan Carr and Alex McDonald. You can join in with the conversation using the hashtag – we’d love to hear which #IJATInscape articles have influenced your art therapy practice or research?